Core Values Are Your True North | Macleod & Co.
As the newest addition to the Macleod & Co. team, I am in the thick of the hazing period. This includes but is not limited to: Nerf gun ambushes, extermination duties, and drinking chardonnay at 3:00 pm on Fridays. Not to mention ‘Friday Funnies’­ — Do you have any idea the kind of pressure it puts on a person to unearth a hilarious viral video that everyone hasn’t already seen? Aside from the bullying, I’ve discovered how truly passionate everyone who works here is about their job, our clients, and the long-term success of the company. And that didn’t happen by accident. As a business owner, how can you be sure your employees are going to represent your company the same way you do? You need to be working toward the same goal, and they need some direction. Core values provide a framework for all operations within a company. They drive the focus and direction for every decision, every project, starting at its core­ — and they are running your organization whether you’ve established them or not. If core values are not clear, it’s time to start drilling. In order to keep these values at the core of a culture, they need to be constantly reinforced. In smaller companies, core values are being universally shared without much need for formal discussion — but what happens when you start to grow? What can you do now to incorporate your core values into the foundation of your business for the future? Walk the walk. Exercise these core values yourself. In business, people only truly follow those they respect and trust. As a leader, the best way to inspire and earn that trust is to lead by example. Hire like-minds. Hire new people based on your core values. If their values are already aligned with yours, you’re ahead of the game. Reward. Offer recognition or rewards when employee’s behavior reflects the core values. Incentives are great for employee engagement. Show. Don’t tell. Connect a memorable visual to your core values. Human beings are visual creatures. Adding a visual element to a non-visual communication attracts, resonates and motivates. This is especially helpful in a creative setting with an abundance of short attention spans. Celebrate. Make celebrations about reinforcing core values. Engaging in play fosters a sense of community and boosts productivity and motivation. Experience. Amazon is famous for having its office workers build their own desk using a door and a sawhorse. They also received their computers in boxes and put them together themselves. A creative ritual that reminds new hires of Amazon’s roots and creates a shared experience. 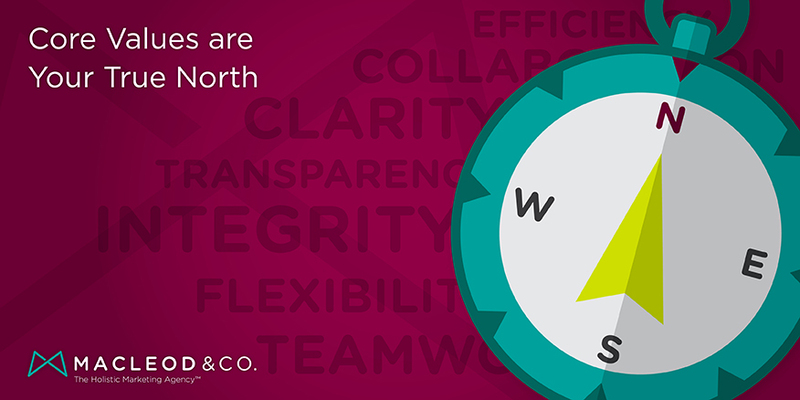 Core values are your organization’s compass — they should guide everything you do. If you can answer “yes” to these questions, you’re off to a good start. If not, give Macleod & Co. a call at 612.315.5200, we can help. Erin Russell is Art Director at Macleod & Co. the Holistic Marketing Agency ™ based in Minneapolis. We believe that in a hyper-social world, culture drives success, every employee is a customer touch point, and every customer is a broadcast network. We live at the intersection of marketing and organizational effectiveness. And we see marketing as the entire process of bringing a product, service or business from inception to maximum ongoing profitability.